The Illustrated talks for the 2018/19 season have been announced and are listed below. Please come along to hear presentations about a variety of subjects from interesting and entertaining speakers in the company of fellow enthusiasts. For details of the venue and more about the Canal Society social meetings, please click here. This talk will discuss the creation of the Cemetery, the design, and the people who have been laid to rest in the Cemetery. The talk traces the history of the Medway Queen since launch in 1924, service on the Thames estuary, use as a minesweeper in WWII and seven trips to Dunkirk, returning to her old route until 1963. Use as an Isle of Wight nightclub from 1966 until 1974, return to the River Medway in 1984, and rebuilding of her hull. This talk will introduce Thames Water with an overview of the company; its geographic coverage, customers and handling volumes of clean and waste water, plus tonnes of dry solid material for disposal. It will describe the sewage treatment with historical development, basic elements in a sewage work, sludge processing, anaerobic digestion, pasteurization and thermal hydrolysis. Finally, power generation in combined heat and power plant plus future developments will also be discussed. During the first world war with the number of casualties being on unprecedented scales, evacuation to the base hospitals at the coast became a major problem. This talk will highlight the role of the inland waterways as a means of casualty evacuation. This show and tell discussion will feature a number of artefacts that have been recovered from the River Thames during dredging operations conducted over a number of years. Of varying ages, it’s remarkable that the objects, some of which are very fragile, have survived mechanical dredging and are available to enjoy today, many years after they were lost or discarded. The Thames and Medway Canal, originally built in the early 1800s, now running from Gravesend to Higham in North West Kent and has an interesting military, engineering and social history. Unfortunately, the canal was never the commercial success hoped for. This talk traces the timeline from initial fundraising, construction challenges, the impact of railway fever, and eventual demise of the canal. Looking forward, the canal could be developed into a green safe water corridor, supporting fishing, informal boating and other activities. Owing to unforeseen circumstances, William Sargent is unable to give his talk on the Metropolitan Police Marine Policing Unit on this date. 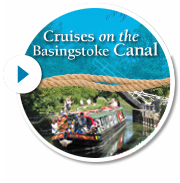 Instead Roger Cansdale is stepping in to give a talk on the historical use of the Basingstoke Canal by the Military, and what the Military has done to and for the Canal over the years.